The Florida Third District Court of Appeals recently upheld the constitutionality of a controversial change to the state’s “stand your ground” self-defense law, but also might have set the stage for a debate at the Florida Supreme Court about how the change should apply in some cases. Stand your ground issues and claims of self-defense are amongst the most heavily litigated matters in criminal prosecutions. It is usually fatal to a criminal prosecution if the prosecutor, in court, cannot effectively refute a valid claim of self-defense. Nicholas G. Matassini, Board Certified in Criminal Trial by the Florida Bar, is actively looking into several self-defense cases throughout the Tampa Bay area where this issue could ultimately have a major impact. The decision Friday by the Third District Court of Appeal in a Miami-Dade County shooting case came a week after another appeals court ruled on similar issues in a Hillsborough County case. The two appellate courts disagreed on a key issue about how judges should carry out the “stand your ground” change in older cases, a type of legal conflict that can spur the Supreme Court to take up the issue. Both rulings dealt with a move by the Legislature in 2017 to shift a key burden of proof in “stand your ground” cases from defendants to prosecutors. In the decision Friday, a panel of the Third District Court of Appeal disagreed with a Miami-Dade County circuit judge, who ruled that the legislative change was unconstitutional because it violated the separation of powers. The circuit court ruling was rooted in the Supreme Court’s constitutionality authority to set rules of practice and procedure for the court system. 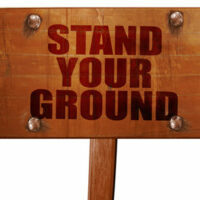 The “stand your ground” law says people are justified in using deadly force and do not have a “duty to retreat” if they believe it is necessary to prevent death or great bodily harm. When the defense is successfully raised in pretrial hearings, defendants are granted immunity from prosecution. Before the change was passed last year, the Florida Supreme Court had said defendants had the burden of proof in pretrial hearings to show they should be shielded from prosecution. With backing from groups such as the National Rifle Association, the 2017 change shifted the burden from defendants to prosecutors to prove whether self-defense claims are justified. In Friday’s decision, the Third District Court of Appeal said the Legislature did not overstep its constitutional authority in shifting the burden of proof. It said lawmakers have “the constitutional authority to enact procedural provisions in statutes that are intertwined with substantive rights.” “The amendment [to the “stand your ground” law in 2017] shifts the burden of proof to the prosecution after the defendant has made a prima facie claim of justified use of force, and it requires that the state [prosecutors] meet this burden of proof with clear and convincing evidence,” said the decision, written by appeals court Judge Ivan Fernandez and joined by Judges Thomas Logue and Edwin Scales. “This is consistent with the well-established legislative practice of passing statutes allocating the burden of proof in judicial proceedings.” The decision came in a case in which Tashara Love sought to use the “stand your ground” law to be shielded from prosecution after a November 2015 altercation outside a Miami-Dade County nightclub. Love shot a man as he was about to hit her daughter, according to the decision. But the appeals court Friday ruled against Love on a key issue, and created a conflict with a May 4 decision by the Second District Court of Appeal in a Hillsborough County case. The issue centers on whether the 2017 shift in the burden of proof should be applied to cases that occurred before the change took effect, an issue known as applying the change retroactively. The Third District Court of Appeal turned down Love’s argument that she should be able to use the 2017 change in a “stand your ground” hearing. Such a hearing had not been held in her case at the time the Legislature approved the change, but the appeals court focused on the law that was in effect at the time of the November 2015 shooting. “We hold that the 2017 statute did not apply to Love’s case because the crime she committed occurred before the amendment’s effective date, and the statute has no retroactive application,” the decision said. But in the Hillsborough County case, a panel of the Second District Court of Appeal said the change should apply retroactively to the case of Tymothy Ray Martin, who was convicted of felony battery in a 2016 altercation involving his girlfriend. Martin had sought to use the “stand your ground” law to be shielded from prosecution, but a judge denied his request in a pretrial hearing. Martin appealed his conviction, and the appeal was pending when the Legislature and Scott changed the “stand your ground” law. In ruling that the change should apply retroactively to Martin, the Second District Court of Appeal overturned his conviction and ordered that he receive a new “stand your ground” hearing under the 2017 law. The Second District panel noted the potential implications of retroactively applying the burden-of-proof change to cases pending in the court system at the time the 2017 law passed, saying it “could impact a significant number of criminal proceedings.” Also, the appeals court asked the Florida Supreme Court to take up the retroactivity issue, a move known as certifying “a question of great public importance” to the justices. In Friday’s decision, the Third District panel also certified the retroactivity issue to the Supreme Court because of the conflict with the other appellate court. Contact Nicholas G. Matassini for a free confidential consultation regarding your self-defense claim. Since 1976 The Matassini Law Firm, P.A. has provided comprehensive representation in State and Federal criminal investigations, including post-conviction and appellate assistance. Visit us at www.matassinilaw.com.